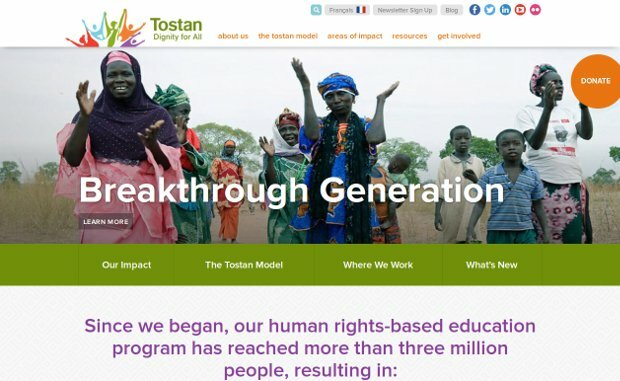 Tostan empowers African communities to bring about sustainable development and positive social transformation based on respect for human rights. They believe that through this mission we can ensure every person—woman, man, girl, and boy—is able to live a life of dignity. Their origins date back to 1974 when Molly Melching first arrived in Senegal as an exchange student from the United States. After completing her studies, she stayed to work as a Peace Corps volunteer in Dakar, creating the first radio program for children in national languages. Her work soon took her to rural villages, where she found that many development efforts were not addressing the true needs and realities of the communities in ways that were relevant to their lives. Relying heavily on community feedback, Molly Melching and a team of Senegalese cultural specialists developed a new type of development program, the Community Empowerment Program (CEP). This program respectfully engaged communities by working in their own languages and using traditional methods of learning. It facilitated community ownership over the development process, allowing communities to fulfill their own potential. Their efforts grew throughout the 1980s, leading Molly to found Tostan —which means ‘breakthrough’ in the Wolof language—in 1991. Over the past 25 years, Molly’s original concepts have developed into a leading model for community-led change – a model that is now implemented in 22 languages across six African countries and is supported at the international, national, and grassroots levels. How did Molly achieved all this? In However Long the Night, Aimee Molloy tells the unlikely and inspiring story of Molly Melching, an American woman whose experience as an exchange student in Senegal led her to found Tostan and dedicate almost four decades of her life to the girls and women of Africa. This moving biography details Melching’s beginnings at the University of Dakar and follows her journey of 40 years in Africa, where she became a social entrepreneur and one of humanity’s strongest voices for the rights of girls and women. Inspirational and beautifully written, However Long the Night: Molly Melching’s Journey to Help Millions of African Women and Girls Triumph is a passionate entreaty for all global citizens. This book is published in partnership with the Skoll Foundation, dedicated to accelerating innovations from organizations like Tostan that address the world’s most pressing problems.